About four months ago, I reviewed "The Uncharted Path" by Rachel Cohen-Rottenberg. At the time, I said that I'd publish my review first but that I wanted to get into deeper territory with it because it's a truly fascinating book. As always, time got away from me and I forgot. (Sorry again Rachel). Anyway, if you haven't read it; my original review is here. In case there are any readers here who don't know Rachel (it's unlikely), I'd better start by pointing out that Rachel blogs at Journeys with Autism. It used to be called Journeys with Aspergers - and there's a whole fascinating story behind that change. In fact, at least some of that change is core material in the book. 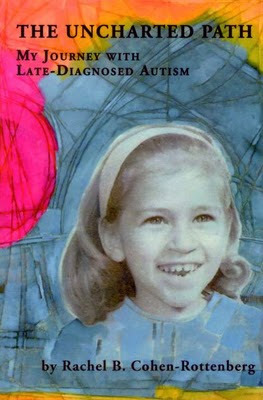 Rachel's take on aspergers and autism is radically different from the theories you've read before. Rachel publishes a lot of really provocative posts over at JWA and I always look forward to them. She's also a frequent commenter here. Rachel and I don't always agree on our interpretation of autism. In fact, it's almost fair to say that we're polar opposites. I like that. I like the fact that someone disagrees with some of my strong-willed attempts to push through the barriers of autism and constantly reminds me that acceptance is ok too. I've taken Rachel's input on board on many occasions and I've been improved by it. Too often I feel tempted to simply push harder when I fail. My answers are often "try again", "try harder" or "find an alternative method". Often these are right but sometimes constant trying and failing has some very negative effects. Instead of saying I've failed, sometimes we need to recognize our limits and accept ourselves for who we are. If you've noticed that tone in some of my blog posts, you can thank Rachel for it. I've learned. I was fascinated and terrified by Rachel's book. Rachel was a senior technical writer for the networking and telecommunications industries. She had pretty high-powered, responsible, well-paying job, a family and everything else by which success in western society can be measured. Sure, she had some social difficulties, sure, she didn't exactly fit in but that didn't matter. She was "successful". In many ways, Rachel's success story is a bit like mine. I like to think that I've had a degree of success in my endeavors too. In fact, one of the primary concepts behind the "Life with Aspergers" blog is that I want to prove that "success" is possible for people on the spectrum. What terrified me about Rachel's story is that somewhere things went SNAP! The Rachel of today is a very different person to the high powered worker. By "snap", I mean that she lost her ability to do her job. Not her technical skills, not her family, just her ability to interact with people in a social sense. My ability to "achieve" means a lot to me. If something like that went "snap" in my life, I'd probably go insane. I'm fiercely independent and I can't cope with being helpless. In fact, my school friends can probably remember the time I had to use crutches. They lasted a single day - then I decided to go without them. My independence is very important to me. Much of Rachel's Journey is about finding her feet after things went "snap". She offers an explanation for the change - and I'm hoping the theory is wrong because now I'm constantly worrying about it. More importantly, her journey is about finding equilibrium and accepting herself and her limitations. Best of all, her story explains how someone can still be "successful" even if they don't meet the western definition of the word. In Rachel's case, accepting herself and her new limitations was the key to regaining her independence and strength. It's an amazing journey and it really needs to be read. You can order "The Uncharted Path" over at Rachel's blog. I could have done a "normal" interview with Rachel but there were burning questions I had about things in the book. As such, you might find these questions are a little specific. Of course, if you've already read her book, you will find her answers fascinating. In the early parts of the book, you talk about a change to the idea that "the possibilities are endless" and you seem to be accepting the fact that you're limited in what you can do. Towards the end of the book your thoughts change to the ways in which you're overcoming obstacles. How do you feel now? Do you now feel like you can do most of the important things with the right preparation? At this point, I'm feeling very realistic about my strengths and limitations, probably for the first time in my life. The expectations that I grew up with--that I could achieve anything I wanted to--would be unrealistic for most people, not just for someone on the spectrum. So, with or without a diagnosis, I would have had to reframe those expectations at this stage in my life or end up a very unhappy person. In terms of basic tasks--cooking, cleaning, shopping, driving, and so forth--I've been able to overcome all the obstacles, mainly because I understand so much better what I'm dealing with now. Pre-diagnosis, I expected to be able to go to the market at any time of day, chat it up with everyone I met, and come home energized. After many years of driving myself, doing so was getting harder and harder. Post-diagnosis, I go to the market during quiet times, I concentrate on doing my shopping, I smile kindly at people I meet, I exchange a few friendly words with the cashier, and if it gets really noisy, I put in my earplugs and communicate in writing. Understanding my disabilities from the inside out has empowered me to adapt to them in all kinds of creative ways, and it's also made clear the necessity of resting and recharging my very sensitive nervous system. Your idea that being "High Functioning" means that "some of us can pass for neurotypical" is a fascinating one particularly given the journey that you've followed. You said that you were able to pass for neruotypical in your early years but it seems clear that you don't think you can now. With your definition it follows that at various points in a person's life they may be able to be high or low functioning depending upon their mental stamina. In fact, some people may be more high functioning on some days than on others. Do you agree? Do you think that the words "high functioning" have any relevance to autism any more? "High-functioning" and "low-functioning" are overly simplistic and two-dimensional words. They can mean so many things to so many people. It's much more important to talk about people's abilities and needs: Is a person able to speak? If so, how is this ability affected by stress, or noise, or upset to routine? If not, what kinds of alternative forms of communication are available? What tasks is a person able to do independently? What are the tasks with which a person needs assistance? These are the really important questions. This is an amazing quote: "Confounding people is the first step toward breaking down their stereotypes about autism". I'm pretty sure that you mean stepping outside expected boundaries rather than confusing. Do you have any examples of how you've confounded people? Sure. When I tell people that I'm autistic and happily married, I confound them. When I tell them that I'm autistic and have a wonderful, well-adjusted, neurotypical daughter, I confound them. When I tell them that I'm autistic and have a master's degree from one of the best universities in the world, I confound them. It's important work to confound people out of their preconceptions, because the stereotypes are so limiting, especially for the younger people coming of age with their diagnoses already in hand. While my parents' expectations for my life may have been unrealistic, I think it's better that I dreamed big dreams. It's gotten me much further in life than if someone had told me that my gifts were only "splinter skills" (a term I loathe with all my being) and of no great importance. You talk about the lack of structure as the start of a downward spiral. What do you do in your life now days to ensure that your life has structure? Mainly, I make lists. I have a list of the things that need to get done every day, and I have a list of the things that need to get done over the course of every week. That way, I have very basic goals on which to focus. I've learned that the goal itself really doesn't matter, so much as having one, because that provides me with a focus. I need to have enough goals each day to keep things structured and interesting, but not so many that life becomes overwhelming and without room for inspiration or spontaneity. I've also started working as a volunteer copyeditor for our local paper, so that gives me even more structure. And then, of course, I have all kinds of other goals to meet---books and articles I want to write, art projects I want to do, a master's degree program I'm applying to, and so forth. There is no end of interesting things to learn and to do. You talk about how words are sacred and you discuss honesty. Do you find yourself "witholding promises" as if the language binds you to a task? (I have a problem using the word "Promise" and won't say it unless I'm 100% certain that I can deliver). Oh, yes! The minute I make a promise, I am committed to carrying it out, come what may. Barring emergencies, whenever someone asks me to do something, I take some time to think about it realistically before promising to do it. You provide some amazing details about sensory overload (the sultana example the co-op shop). Does this happen often is it increasing or decreasing as you begin to learn your boundaries and triggers? Overload seems to be happening less and less, but that's because I'm so keenly aware of what absolutely does not work and I stay out of situations that trigger it. It's not really something I have to think about anymore. I have an auditory processing condition that makes filtering words in ambient noise very difficult, and my nervous system signals me right away if I'm about to enter into something that will overload me. I've also found that since I've started blocking my hearing in noisy situations, I'm much less overloaded by visuals. In fact, the visual world has become an absolute delight to me! For instance, when I wrote the book, I was taking a break from driving because all the visuals were becoming exhausting. Now, I'm driving again and enjoying it very much, because my auditory system gets the rest it needs on a regular basis. As a result, my whole nervous system is more rested, and my other senses can function at a much higher level. One thing that strikes me about your story ids that you seem to "suddenly" go from being a high powered facilitator to someone who can't handle a family conversation at a restaurant. It's something that I'm terrified of because I'm at the "spinning plates" stage and I can't afford to stop. What changed and how? A large part of it is that my auditory processing condition has gotten much worse over time. It may be from my having overworked the system in the decades before I understood what was happening, or it may just be aging. I'm not sure. But I also want to point out that there's a difference between facilitating meetings and having a conversation in a restaurant. When I'm the facilitator, there are clear rules, people have given me the authority to move the conversation where it needs to go, and the meetings tend to take place in a quiet environment. For instance, I'm facilitating ASAN-VT meetings and I do just fine. A four-way conversation in a restaurant with a husband and two neurotypical teenagers is a whole other deal. It's unstructured, it's noisy, and teenagers are definitely not about to give me the authority to control the conversation--nor would I want them to. They have their own pace and their own style, and I completely support that. Great interview. I loved Rachel's book, but it gives me some comfort to know that I wasn't the only one it scared. These answers definitely give me a more complete picture of Rachel, ASD, and what it might mean for me going forward. Thank you and Rachel for this post and the interview!